"Ever After" is the retelling of every little girl's favorite fairytale - Cinderella - as told by Cinderella's great-great granddaughter. Picture a young girl, Danielle, daughter to a widower French nobleman who dotes on his only child. In the matter of a day, she is thrown from a fairytale life as the somewhat untamed mistress of her own home into one of despair. Her father brings home a new wife and two prim stepsisters, and then falls to his death before her very eyes. She is left alone with a complete stranger as her guardian; her chance for happily ever after ripped away from her. Now, flash forward ten years. Danielle, played by Drew Barrymore, is a strong young woman who is treated as little more than a servant by her cold-hearted stepmother, the Baroness Rodmilla De Ghent, played by the formidable Anjelica Huston. While the Baroness continues to spend money the family does not have to maintain the appearance of nobility, Danielle struggles to keep food on the table and her family's servant from being shipped off to the New World as a prisoner. The servant's only crime was being the only male in the household, so he went to jail to make good the debts of the Baroness and her daughters. As Prince Henry, played by Dougray Scott, flees his royal responsibilities, he runs into Danielle for the first time. She immediately makes an impression on Henry by beaning him between the eyes with an apple. With each passing meeting, she makes an even more lasting impression on the sullen prince, until he finds he loves her. Of course, this does not set well with the Baroness who has two daughters of marrying age, whom she considers far more suitable to the role of royalty than the underappreciated, coarse Danielle. She goes out of her way to ruin Danielle's chances with the young prince. She thoroughly humiliates Danielle by publicly denouncing she is a commoner at the ball before Danielle has the chance to tell Prince Henry herself. Fortunately for Cinderella fans everywhere, it is too late. Once Henry gets over the fact he is in love with a servant, he runs back to his only love; he runs to his Danielle, who gladly takes him back, knowing he is her second chance at happily ever after. Anyone who has ever seen Anjelica Huston at her evil best wants to see her get what she has coming, and in her role as the Baroness in Ever After, she does. The newly crowned Princess Danielle sentences her to a life of servitude, just as the Baroness had sentenced Danielle from the time of her father's death on. In the traditional fairytale, Cinderella spends her time talking to wee creatures, weeping over her fate, and is in dire need of rescue by both Prince Charming and her fairy godmother. In Ever After, Cinderella is too busy running a household and providing for her family to play, and she does not look to the prince for salvation. In fact, in one amusing scene, it is she who rescues the prince from a band of gypsies by bargaining for his freedom and carrying him out of the gypsy camp on her back. This scene affirms what the viewer already knows - Danielle is a strong woman, capable of physical labor and strategic bargaining. Through the entire movie, Prince Henry is portrayed as conceited; spoiled, bored with the many blessings he has grown up with and taken for granted. It is only through his association with Danielle that he learns to truly be a leader to his people. Before her, Henry enjoyed the concept of philosophy but had no clue how to apply the knowledge he had. He is the delicate bud that blossoms into a rose - the viewer already knows the true value of Danielle. We have all heard the story of the fairy godmother and how she came to Cinderella's rescue. It is this magic that makes the fairytale a timeless favorite. Ever After does away with the fairy godmother but not with the magic. Instead we meet Leonardo da Vinci, played by Patrick Godfrey, and the magic of knowledge and common sense comes to the rescue in place of Bippty Bobbity Boo. When the Baroness locks Danielle in the cellar, it is da Vinci who manages to release her. He doesn't have a key, but the brain power to remove the pins from the door hinges, disabling the door. He then creates an enchanting set of fairy wings for Danielle to wear to the masquerade ball. In effect, Danielle becomes her own fairy godmother, taking her fate into her own hands. 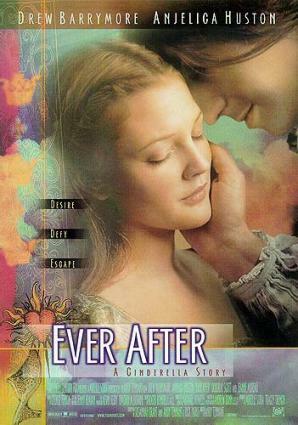 Ever After was directed by Andy Tennant, who most recently was credited with directing Will Smith in Hitch.